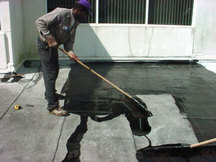 Pioneers in the industry, we offer polymer modified bitumen for waterproofing from India. Our company has risen to prominence in the field of manufacture, supply and export of Polymer Modified Bitumen for Waterproofing. Elasto Multiseal is highly elastic and highly flexible liquid applied single component water proofing system. It is a high performance ready to use Polymer modified Bitumen coating. Elasto Multiseal provides a protective flexible waterproof which has high resistance to cracking due to structure movements. It has a special base material suitable for bitumen surfaces also, which does not involve removing old bitumen coatings, if sound. It provides tough and durable coating which cannot be easily damaged and worn out. Refurbishing of old bituminous (including torch – on membranes) roofs. Sealing of balconies, terraces, parking garages, asbestos and concrete roofs and decks against surface water. Sealing of industrial wash rooms, shower and bathrooms. Sealing of water reservoirs and swimming pools. Sealing of foundations, cellar walls, retaining walls, bridges which are in regular contact with soil. Upon drying, Elasto Multiseal forms a highly flexible black seamless waterproof membrane. Elasto Multiseal is applied cold and does not require pre-heating like normal bitumen based coatings. This eliminates fire or health hazards. Elasto Multiseal has excellent adhesion to dry as well as damp and primed surfaces of concrete, plaster, masonry, bituminous roofing, felt, asphalt coatings and metal. Elasto Multiseal does not become brittle when exposed to low temperatures and does not flow when exposed to high temperature. Its sealing properties do not change when exposed to temperature between -25°C and + 100°C, even if exposed to UV radiation at the same time. Elasto Multiseal has a long term ageing stability and a high resistance to UV radiation; no intermittent repairs are normally required. Elasto Multiseal has a high resistance to impact stresses because of its long lasting elastic properties and provides a safe waterproof coating particularly at vulnerable spots and surfaces. Looking for Polymer Modified Bitumen for Waterproofing ?